Drones are unmanned aircraft systems (UAS) that are increasingly being used recreationally and professionally. As a result, there is an increasing need to ensure these craft are flown safely and within regulations. Keep drones away from overhead power lines. 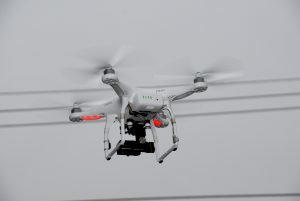 If a drone flies into a power line, it could cause power outages. It could also result in downed lines, which pose a dangerous electrical safety hazard. The falling debris could also endanger public safety. Touching a downed line or anything it has fallen on, like a fence or a tree limb, could get you injured or even killed. Stay away and instruct others to do the same. If you come across downed power lines, call 911 to notify emergency personnel and the utility immediately. Before flying the drone, check it for damage. Have a damaged drone repaired before use. Never fly drones higher than 400 feet. Do not fly the drone beyond your line of sight. Do not fly near airports, manned aircraft, stadiums, or people. Do not fly for commercial purposes, unless specifically authorized by the FAA. Do not fly in bad weather conditions, such as low visibility or high winds. Never fly your drone recklessly. You could be fined for endangering people or other aircraft.